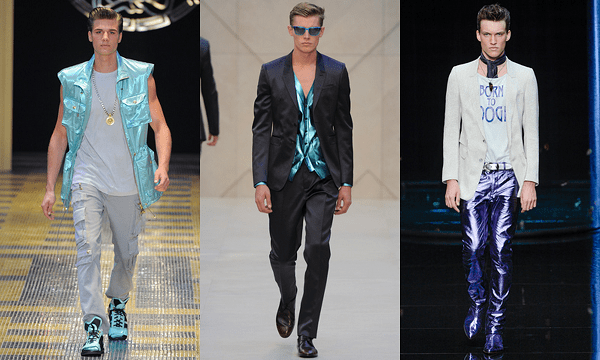 The Milan Spring 2013 menswear shows have kicked off with a bang, highlighting some trends men will begin seeing next year. The collections’ color pallets ranged from bold & bright to dark & rich. Now, keep in mind that this was Milan Fashion Week, and often designers show a more complex and dynamic collection than will end up in stores. The looks might not make it State-side, but there were three trends I believe we’ll see in stores next spring. 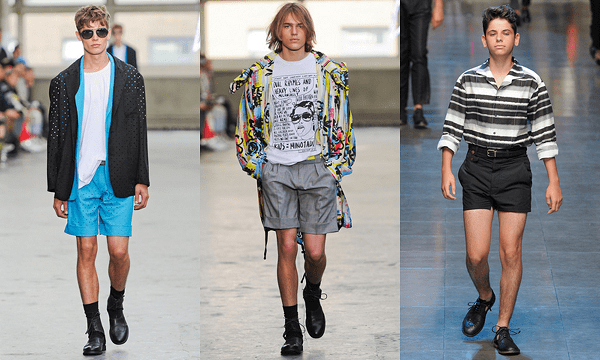 Topman and Dolce & Gabbana were just two of the collections that highlighted a short short for guys. Topman stayed with a length that most guys would feel comfortable wearing… But Dolce & Gabbana went with a more drastically shortened length. I know a lot of younger guys are already embracing the street look of a short short. Some brands are even building a loyal customer base around the shorter short trend. I feel that the younger gentleman will be more open to embrace the shorter length than the average older guy. Locally, what will we see next Spring? This year, more guys have ditched the cargo shorts and embraced other short-pant options. I project that there will be a growing popularity in colored cotton shorts, but I don’t see the warm embrace of the super-short length that Dolce & Gabbana showcased. I’m not going to lie – I am most excited to see how the metallic trend will get incorporated into menswear. Versace, Burbery Prorsum and Roberto Cavalli all lead the charge in showcasing metallic details into their collections. Now, before you pass judgement on the trend, take a look at the full collections. Versace presented a sporty styling of the metallic detail. Pairing the reflective fabric with muted neutral colors. Burbery Prorsum presented a piece I instantly fell for: a metallic cardigan. I would wear it all spring. The metallic material looks perfect with a navy suit. The Spring collections also included a lot of texture-mixing, and the detail is in the styling. For example: the sunglasses colored in the same hue as the cardigan is a fantastic pairing. If you aren’t feeling the sporty or chic styling, maybe you’ll like the David Bowie-inspired look from Roberto Cavalli. It wasn’t a shock to see Cavalli use metallic in such a rockstar way. Even the simple combination of a graphic t-shirt and pants make a great look (…but the detail of the ascot and blazer polishes off the look in true rockstar style). I don’t expect to see men start going out on Saturday night in metallic pants, but I’m sure the use of metallic will appear in smaller details in local men’s wear. I just hope guys don’t go to The Buckle and pick up the newest foiled print Affliction shirt and try and pull it off as trendy. I could see local guys maybe incorporating the metallic material in the accessories: Pocket Squares, Bracelets, and shoes. It would be a dream to find a metallic cardigan for next year. My eyes will be searching. Normally, for Spring collections are expected to embrace the bright and bold color pallet. There were a few collections from Milan Fashion Week that presented some bold colors, but I think the trend we will see more of for Spring 2013 is a rich color pallet. Sand tones were used frequently. From rich navy hues to deeper shades of grey, there was a extra richness of color in many of the spring collections. 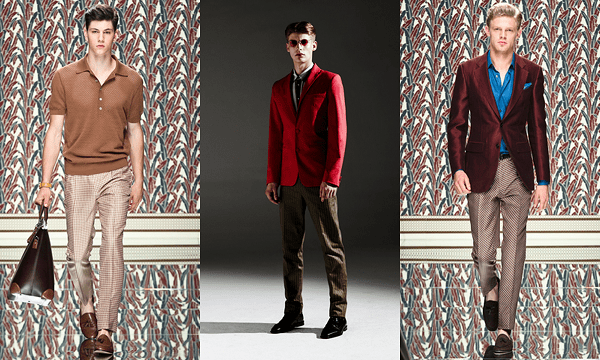 Ermenegildo Zegna and Jonathan Saunders best represented this color pallet. Now, don’t start thinking that the bold bright colors are going away. They were often used to accent the deeper shades. Jonathan Saunders had a look (not pictured) of an emerald-striped pant with a black sweater and a bright yellow tie. When I consider of all of the Spring 2013 trends so far, the richer colors are going to be the look we see most embraced, locally. I hope the use of bright colored detailing takes off in Indy, too – I think that the fashion-forward business professionals will have more fun with this trend. I think that more sand tones and navy colors in men’s suiting will be a nice change from the black and gray. I hope to see those who work in more creative business fields embrace adding a rich toned blazer to their collection. The deep red is a great color for browns, military green, and even tones of grey. What is your favorite trend from the Milan 2013 shows. Leave a comment below, or tweet using #MSpring2013 and share if you agree or disagree with my top picks for next year.